You can rest assured that—if it's a genre film—it's most likely been covered by the Twitch team from the moment a glimmer of malice appeared in the filmmaker's eye. Such is certainly the case with Joko Anwar's The Forbidden Door (2009) [site], the midnight screening offered in the International Showcase of this year's edition of the San Francisco International Asian American Film Festival (SFIAAFF). After exchanging email, Todd Brown finally met Joko Anwar (Kala, Janji Joni) at the 2008 Udine Far East Film Festival and hailed him as "the very best of the current crop of directors in Indonesia." He cited the film's official synopsis: "A successful sculptor whose life [is] run by [a] domineering wife and mother discovers a secret organization in which members can watch the lives of [the] most dysfunctional, depraved families in the town which are fed from hidden cameras. When he stumbles upon a channel showing a little boy who's being viciously abused by a crazy couple, he tries to find the kid to save him. But his quest leads him back to a secret door in his own house that could be the answer to many puzzles." After that meeting, Todd pretty much kept up with every new production still, poster or available trailer for The Forbidden Door and offered them up to the Twitch readership (though, unfortunately, as is often the case with time and other thieves, some of those links are now broken). 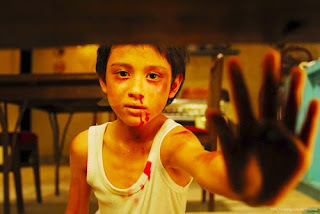 Equally an Anwar fan, Ard Vijn picked up the baton when The Forbidden Door had its international premiere at the 2009 Rotterdam International Film Festival, where he reviewed same. However qualified—Ard had difficulty feeling sympathy for the film's protagonist and mean-spirited narrative—he nonetheless found the film's shocking ending a satisfying achievement. 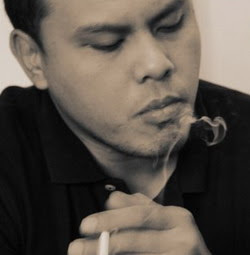 Further praise went to the film's stylishness: "Deeming the real Jakarta to be too dirty looking, Joko Anwar ordered a fake, cleaner version to be built using several big sets. Like with Kala this makes it seem as if the story takes place in some alternate universe where everything is slightly more stylish, colorful or menacing. The sheer amount of gloss and polish totally defies the small budget: the film cost less than 600.000 USD to make but easily looks ten times as expensive." In fact, Ard considers the film's "sultry atmosphere" to be "the real star of the movie." The Forbidden Door went on to make appearances at the 2009 New York Asian Film Festival (NYAFF) where it was described as "a 19th century gothic novel adapted by Alfred Hitchcock and directed by David Lynch" and "one of the sickest, kinkiest movies" NYAFF had ever screened: "Graceful, gliding and with a Bernard Herrmann-esque score we feel confident when we say you've never seen evil look quite so beguiling." Canfield reviewed the film at NYAFF and cautioned: "This blood-soaked unpacking of what it means to sell-out should haunt anyone who has ever called themselves artist and asked to be paid for it." He concludes: "Incorporating elements of the Hostel series, film noir and psychological horror this begs to be seen on the big screen where the arterial spray can underline the Shakespearean sensibilities. Part tragedy, part drama, and hard to watch this is dangerous filmmaking made all the more dangerous by the line it walks between exploitation and truth telling." Guest reviewer Joshua Chaplinsky offered a second perspective, acknowledging The Forbidden Door's "tasty amalgamation of Lynch, Hitchcock, Hostel, Videodrome, Takashi Miike, The Usual Suspects and Shakespeare." Though considerably less impressed than Canfield, Joshua concludes that The Forbidden Door "digs below the surface in an attempt to raise larger questions. Is it an allegory about artistic integrity? A treatise on marital fidelity? A commentary on violence and the media?" Though mystery might be what gives the film its momentum, Joshua cautions: "Unfortunately, as is often the case, the answers cannot live up to the questions asked, and this is where the film falters." Guest reviewer Teresa Nieman offered a third take for Twitch when the film appeared in Vancouver: "In a nutshell, we get Dumplings meets Videodrome meets Hostel, by way of an Indonesian Tarantino." She summarizes: "The good news about Joko Anwar's follow up to the brilliant Dead Time (a.k.a. Kala, or The Secret) is that it's bigger, more ambitious, and seems to have had a much more lenient editing process. The bad news is that ... it's bigger, more ambitious, and seems to have had a much more lenient editing process. Yep, it's one of those." Coming full circle, The Forbidden Door was announced on the line-up for the 2009 Udine Film Festival, screened at Toronto After Dark 2009, and won "Best Film" at the 2009 edition of PiFan. 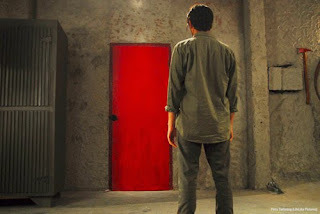 There's not much more to say other than that, clearly, The Forbidden Door continues to reveal Joko Anwar's promise checkered among his faults and it's certainly his promise that excites reviewers (who tend to be willing to overlook his faults). I felt the film couldn't decide what it wanted to be and—though certainly stylish in its look and tone—some of its cinematic waystations worked better than the film as a journey. For example, its resemblances to Videodrome were what impressed me the most—prurience and perversity are always a welcome cocktail—and I have to admit that I was genuinely creeped out by the story of the abused child, which seemed so real and exploitive that I was left no room to feel comfortable. I could probably say the same about protagonist Gambir's stringy haircut. Yeesh. And every time the red forbidden door loomed into view, I thought of that faux trailer Don't from Grindhouse. Don't open that red forbidden door. DON'T! Aside from Twitch, The Forbidden Door has received favorable critical praise. Richard Corliss at TIME—who caught the film at NYAFF—wrote: "As slick as it is sick, the movie could be Anwar's calling card for international employment, if only Hollywood moguls wanted something out of their own narrow range". Corliss appreciated the film's effort to be something that others "rarely dare to try." At The Hollywood Reporter—as quoted by Misa Oyama in her SFIAAFF program capsule—Maggie Lee opined: "A stylish and teasing chiller that unlocks a chamber of Freudian horrors, The Forbidden Door would make Hitchcock and Almodovar proud" and mentioned that "Joko Anwar accessorizes his creepy suspense-horror with a dazzling array of auteur-homage."